Degas was the only member of the Impressionist circle to generate a major body of sculpture. He sculpted his figures from a soft modeling material chiefly composed of wax. He preserved these wax sculptures in his studio for many years, and they were found shortly after his death in 1917. It was left to Degas' heirs and executor to oversee the casting in bronze of these wax originals. At the Hébrard foundry in Paris, a special studio was built for the difficult and delicate work of reproducing these waxes in bronze. The seventy-one unique Simon modèles are the original bronzes cast from Degas' waxes, and served as the foundry models to reproduce all of the subsequent sets. The "Rearing Horse" is a phenomenally realistic and beautiful interpretation of the animal's gesture. The thrust of its head, graceful sway of the neck and raised front legs convincingly convey movement and strength. The textured surface adds to the work's naturalism. This remarkable sculpture shows a moment of high drama. Something has frightened this animal, and instead of smooth, logical forward motion, his body and limbs are moving in different directions. His forelegs rise off the ground, but his back legs are deeply flexed and splayed out. They fully support his weight and counter the powerful backward thrust of his body. The neck is marked by deep grooves, as the horse twists to the left and cranes his head upward. Even the ears, held at odd angles, the bulging eyes and the open mouth express fear and energy. Any second, the position will change completely—yet Edgar Degas has captured it for all time. We know of several drawings by Degas and at least one painting that include a horse in a similar pose, seen from different angles. 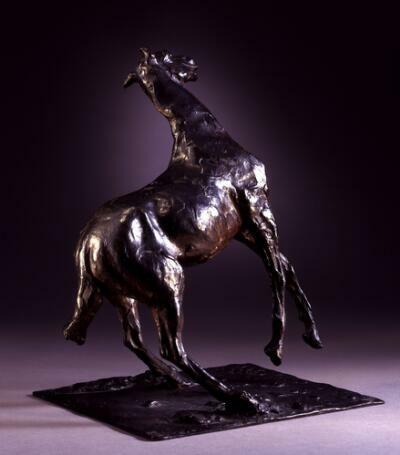 Other sculptures in this gallery show horses in many different positions—take some time to look at them and enjoy how Degas captured the power and elegance of this animal in all its forms.